All aboard for a bird’s-eye view of Manhattan on a helicopter tour of top New York City sights. See Central Park, the Hudson River, Rockefeller Center, and the Empire State Building, and fly past the Statue of Liberty, South Street Seaport, and the 126-year-old Brooklyn Bridge. Treat yourself to all this plus even more of New York's famous skyline. Several departure times are available throughout the day. 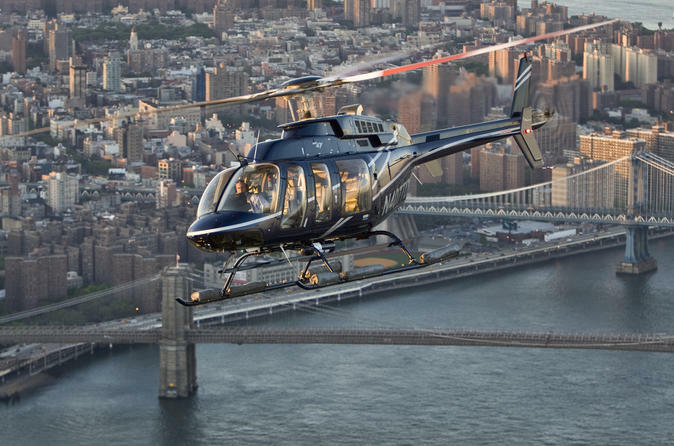 Your experience in the sky starts as you board your state-of-the-art helicopter at the Downtown Manhattan Heliport for your 12- to 15-minute flight. Enjoy aerial views of Central Park, the Hudson River, and New York Harbor including the Intrepid Sea, Air & Space Museum. Spot Rockefeller Center, the Empire State Building, the Chrysler Building, and the World Financial Center, and capture views of the Statue of Liberty and historic Ellis Island before soaring over the neighborhood of Greenwich Village. Other sights include Freedom Tower, Chelsea Piers, the MetLife Building, South Street Seaport, and the iconic Brooklyn Bridge. Your tour ends when you return to the heliport.